Cataract surgery involves removing the cloudy crystalline lens of the eye and replacing it with a perfectly clear one. Nowadays, these lenses are usually made of flexible clear plastic materials which can be folded and injected through very small incisions of 1.8-2.75mm in width. Most people are not aware that there are various brands competing in the ophthalmic market, and let the doctor make the decision as to which lens to implant in their eye. All well and good, but have you ever wondered what the factors are, that are taken into consideration when selecting a lens? Were you curious to know why your doctor chose the particular lens that was implanted in your eye? Let's take a step back, and list the important properties of a lens that is meant to stay in the eye for the rest of a person's life. Let's take point 1. Current materials in use such as silicone and acrylic polymers do stay transparent for many years. 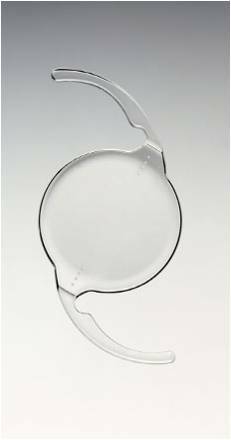 In the past some hydrophilic acrylic materials became opaque after developing calcium deposits in the lens optic and had to be exchanged. Among the current lenses, the concern is increasingly with the development of so called 'glistenings' in hydrophobic acrylic lenses. These are tiny water vacuoles that develop in the lens material and have been shown to cause increased forward light scatter, which can reduce contrast. 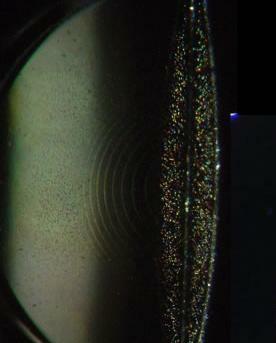 (Notice the minute white dots in the picture below) Although any hydrophobic acrylic material can have this problem, it has been reported especially in lenses made by Alcon, and these include all Alcon Acrysof lenses that are currently being used including the SN60WF (IQ lens), SN6ATT (toric lens), SN6AD1-3 (multifocal lens) and SND1TT/SV25TT (multifocal toric lens). 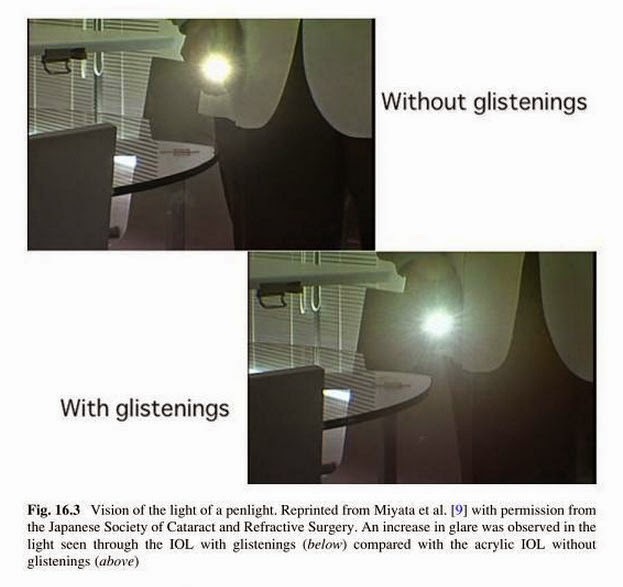 To be fair, not all Acrysof lenses get such significant glistenings, but it is disturbing that firstly, we cannot predict which particular Alcon lens will get a more severe problem with glistenings, and secondly, among those who develop the problem the glistenings tend to get worse with time. 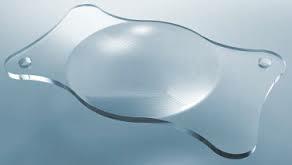 The only FDA approved and certified glistening free lens currently is the Envista lens by Bausch and Lomb, which is also made of a hydrophobic acrylic material. Almost all other lenses have some degree of glistening formation after some time in the eye, but none to the same degree as what is seen with the Alcon Acrysof lenses. What about point 2? For the photographers out there, the term 'aspheric' would ring some bells. It turns out that on average, our cornea has +0.27 microns of positive spherical aberration (at 6mm diameter), so if a lens implant has -0.27 microns of negative spherical aberration, the two would cancel out nicely leaving no spherical aberration and improved contrast sensitivity. This has been borne out in some studies, and the effect is more noticeable in dim light when the pupils are more widely dilated. remember that here we are talking about an average figure, so patients with lower degrees of corneal spherical aberration, or those whose lenses might be expected to centre poorly due to pre-existing factors like weak zonules should have an aberration free lens like the Envista lens instead. The problem is that an off centre lens with any built in aberration (like negative spherical aberration in the Tecnis lens) will cause even more aberrations and blurry vision. Most lens implants in use today are meant to be implanted in the 'capsular bag'. This is like the 'skin' of the cataract that is left behind, and it is in this thin membranous capsule that the new lens sits, right in the same position as the original cataractous lens. Sometimes the original lens cells grow and form a layer behind the new lens implant, blurring vision again. Although this can be very simply treated with a 5 minute YAG laser posterior capsulotomy, it's much better to avoid it in the first place. To this end, most lenses nowadays have a 90 degree sharp peripheral edge, so that when the capsule shrink wraps itself around the lens implant there is a 90 degree bend in the capsule which stops the migrating cells dead in their tracks. A lens should also sit in the capsule and conform to the size of the capsule as much as possible. It is known that capsular diameters vary among different people and can be larger in people who are highly shortsighted. Flexible loop haptics (like in the lens shown above) allow the lens to be made with haptics of slightly larger diameter, since their flexibility allows them to be compressed for smaller capsules. Plate haptics (like in the lens shown below), however, are rigid and do not allow this kind of ability to adjust for different capsular sizes. They will unduly stretch smaller capsules, and if they are put into larger capsules they either decentre or may move around inside the capsular bag. Woe also to the capsule that contracts and fibroses with time-they will compress and vault a plate haptic lens, causing a refractive shift, usually in a hyperopic direction. The last point is important but has usually been taken care of in very preliminary studies, and currently lens materials are very biocompatible. Silicone is currently less commonly used, not because it causes reactions or inflammation, but because if a patient has retinal surgery and injection of silicone oil, this oil will stick to the silicone lens andspoil it. I would have a look at the 6mm corneal spherical aberration first. If it is highly positive, or there is a large amount of corneal astigmatism, the Tecnis lens would be ideal. If the spherical aberration was low, with little corneal astigmatism, I would go for the Envista lens and be guaranteed of no glistenings. Notice that these lenses are both flexible modified C loop designs. I would avoid plate haptic designs or those with rigid 3 or 4 haptic designs. **Would I have a multifocal lens in my own eye? I think not. Presbyopia is not a nice thing to have, but for me personally I think it would be worse to have to put up with constant halos and poor contrast which is only correctable with another surgery to replace the lens! Thanks for providing a brief information about cataract eye surgery. It is one of the most efficient and latest techniques that eliminate the use of blades or other surgical hand-held tools.